"Then, downloaded Mozbackup 1.5.2 on new PC and stuck in the flash drive with the Mozbackup 1.5.2 data on it from the old PC. I then clicked on my TB icon but got this error message: "Your Thunderbird profile cannot be loaded. It may be missing or inaccessible."" Did you use Mozbackup to restore the profile that is stored in the *.pcv file? Mozbackup is used to both backup and then later to restore the backed up data. I totally misunderstood what that adviser was telling me to do. And, at that time I didn't have presence of mind to explain that wasn't the information I was looking for, because I was knee-deep in the holidays and my brain misfired. I was asking how do I copy/paste what is in the flash drive into my new PC, which is exactly what you're asking me. As you can see above, the flash drive is now in my new PC's USB port, but, I don't know how to copy/paste this data into TB. So, how DO I copy/paste the mozbackup files into TB? OK, here's where I get lost. ..."just run Mozbackup against that .pcv file." I did figure out how to get the TB profile from the old laptop onto a flash drive with some help from different articles here in the TB Forum, so there's that, and I did read the link you supplied me with, but got stopped at step #2 under Restoring/Migrating where it says, "Launch Mozbackup, choose the "Restore" option, and follow the instructions. I don't know how to "Launch Mozbackup." Just what does that mean and how do I "launch" it? I've tried several different things, but nothing I've been able to figure out winds up in a "Launch." You techie guys speak and live this language on a daily basis but we stoneheads out here don't. As much as I hate to declare my ignorance, I, unfortunately, need instructions broken down into pieces. So, if you'd please take a moment to list some steps on how I can "run Mozbackup against the .pvc file" or "launch mozbackup" once the flash drive is in the USB port, I'd be forever grateful. I simply have no idea how to do it. And the error message, "Your Thunderbird profile cannot be loaded. It may be missing or inaccessible" was eliminated by uninstalling TB and reinstalling it, again. I was able to figure that out. Please keep in mind I'm 72 yrs old, and am pretty proud of myself for being "plugged in," electronically. I've been online since 1999, and have a tablet, an old laptop I'm trying to migrate into a new one, a desktop and a cell phone. I started with a Gateway desktop back in 1999 and since then have had 2 other HP desktops. I'm pretty familiar with Microsoft software, but anything resembling coding is way beyond me. Also, I'm new to Mozilla and just haven't learned how TB stuff works, yet, but I will. Thank you for your time, or anyone else who might come in here and post some advice. I don't know how to "Launch Mozbackup." That just means run the program, perhaps by double clicking on the icon for the Mozbackup program displayed in Windows File Manager. When Mozbackup runs, there will be options to create a backup or to restore from a back up made previously. "I don't know how to "Launch Mozbackup."" 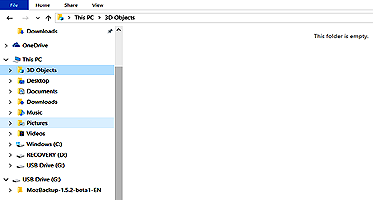 The simplest way is to double click on the executable in file explorer (windows 10 version of windows explorer). Launch just means run. Ok, I think I've finally got it. When it was explained to me to look for an .exe command, I knew what I had to look for. Figuring it out took a minute, but I got it. I just now plugged in the flash drive, and, saw Mozbackup-1.5.2.-beta1-EN in the File Explorer. I left-clicked on that, and a list of 9 items came up. One of them was Mozbackup (dot) exe with an icon. I knew that's what I was looking for. I clicked on that and got the Wizard. I'll go through the steps and be back when I'm done. I'm sure there will be more questions......lol. Or not. It may go smoothly. OK, well, that didn't work. Guess I didn't upload the TB profile from my old laptop into the flash drive, after all. How do I upload the TB profile from the old laptop onto the flash drive? 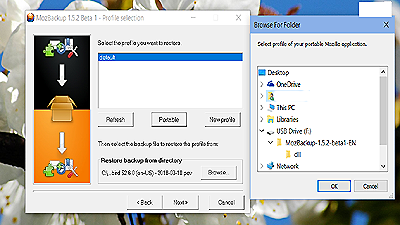 Back up the old profile on the laptop using Mozbackup. Then copy the *.pcv file it created to the flash drive. tanstaafl wrote: Back up the old profile on the laptop using Mozbackup. Then copy the *.pcv file it created to the flash drive. I thought that's what I did the first time. I mean, it's not a complicated procedure to "copy" the Mozbackup file and "paste" it onto the flash drive in Drive: F, but, obviously the results in the screenshots show I didn't do that properly. I'll go do that now, and get back to you with the new results.